A triage nurse’s ability to quickly capture critical patient information and accurately assign the appropriate triage level is vital to an Emergency Department’s success. Given the wide array of patient presentations this can be a daunting task for many emergency nurses, regardless of their experience level. 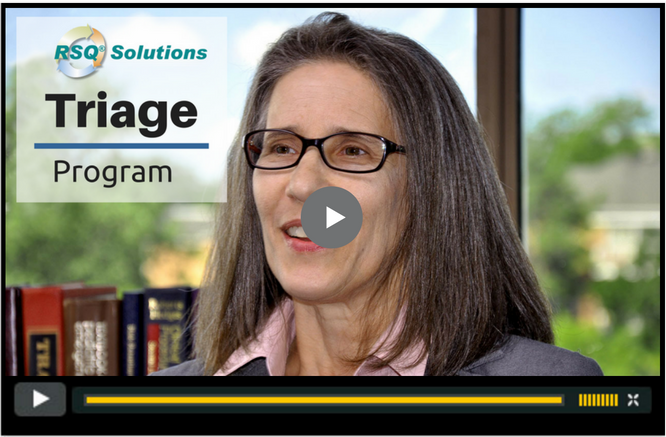 By partnering with Shelley Cohen, RN, MSN, CEN from Health Resources Unlimited, The Sullivan Group designed a comprehensive online training solution to improve clinical competency and decision making at triage. The RSQ® Solutions - Triage Program satisfies every Emergency Department’s need for an effective ongoing triage training program. This online training suite provides organizations with the tools needed to ensure high clinical performance and deliver high-reliability care during the triage process at their facilities. Providing nurses with both educational training and continuous feedback on their performance mirrors The Sullivan Group’s proven RSQ® Cycle that has led to consistent change in clinical behavior and positive patient outcomes.